Paighton Pinkerton and Sophie Barnes took the top prizes in the Patchell Group colouring competition held at the Expo at Mystery Creek In March. Eight-year-old Paighton, from Tokoroa in the Bay of Plenty, took top spot in the Over 5 section, and her artwork won her a scooter. Sophie’s picture gave her victory in the Under 5 section and she’s now the proud owner of a brand-new bike, her prize for winning the contest. 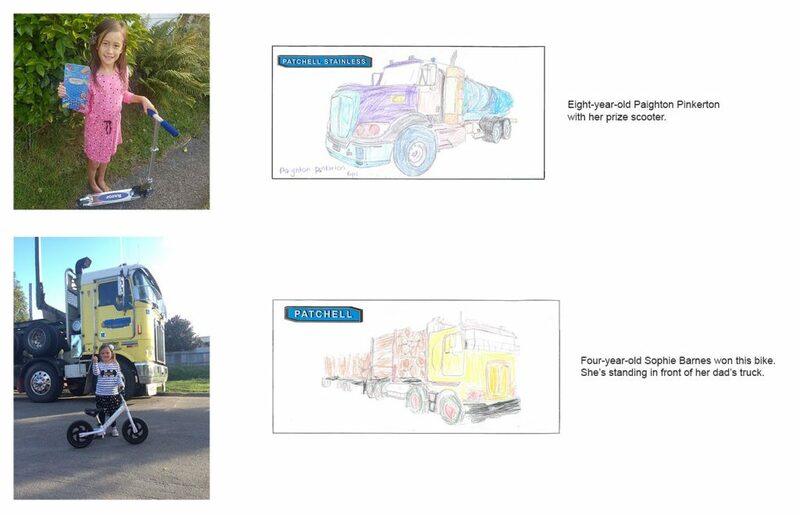 Four-year-old Sophie, from Waipawa in Hawke’s Bay, based the colours she used on the truck in her entry on those carried by her dad’s big rig. Paighton’s father also works in the trucking industry. Patchell said “it’s really neat that the children are positively inspired by the Industry. “There were lots of fantastic entries…It was a tough choice, but a panel of three finally came to a conclusion..,” the company added.